How do you take your books? “With a cup of tea or a gin and tonic depending on the time of the day,” I replied with a grin. 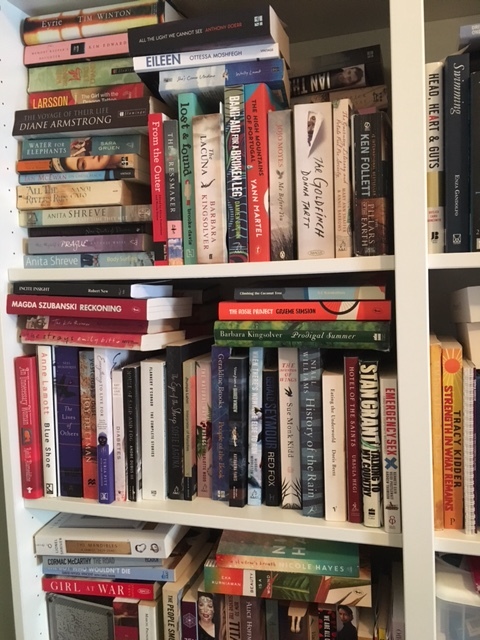 With bulging bookcases and little space, some years ago, I began reading my books electronically saving space and weight particularly when on holiday or travelling. Reading on my iPad meant I didn’t have to search for the best lighting – I could just take it with me. Simple and easy. The cost of electronic books was also very affordable which meant I could buy more. With so many advantages to reading on a device, why don’t more people buy and read their books that way? Perhaps it was a fad but I find myself now reverting back to the good old paperback. I like to hold it and flip the pages back and forwards. To read the blurb on the back cover, inside cover, to look at the artwork. Sure I can do that electronically, but I like the feel of it in my hands. Sometimes I just don’t want to look at another screen. I like to read in bed – a paperback doesn’t hurt as much as a dropped iPad on the face. Yes, that has happened to me. I bought a new book shelf and I actually love to look at my books – I don’t get that same feeling with the books on my device. Sometimes, I scan the shelf, pick a book I’ve already read, open it anywhere and start reading. I’m also fussy when I buy a paperback not just because it’s more expensive but it has to earn its place on the tight real estate space of my book shelf. I haven’t totally given up electronic books- I still get them occasionally. Now I’m thinking about audio books. I can listen while I’m out walking or driving and I like that idea. Thinking about that question again, I’d say, I take my books in a variety of forms but I prefer the paperback. This entry was posted in Writing and tagged book shelf, books, ebooks, print books, Reading on March 28, 2017 by S.C. Karakaltsas.